Get the best of both worlds with Sure-Seal™ foam sealant tape: A convenient tape that performs like closed cell foam with the flexibility and compression recovery of an open cell tape. Advanced RV sealant tape replaces putty tape, butyl tape, caulk and spray foam to stop air, vapor, moisture, dust, sound AND vibration for over 20 years. Impregnated urethane sealant tape is a remarkably compressible foam that molds itself to irregular surfaces for extreme sealing that lasts more than 20 years. Ultra-conformable foam paired with an aggressive adhesive makes Sure-Seal™ foam tape the ideal, money-saving sealant for manufacturing RVs, campers and motor homes. 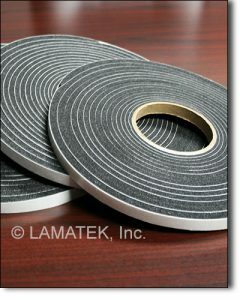 Foam sealant tape is available in thicknesses ranging from 1/4″ to 1 1/4″ and custom slit from 3/16″ to 39″ wide. LAMATEK also supplies custom die-cut gaskets to fit your specific size and shape requirements. Sure-Seal™ tape forms an airtight and watertight seal when compressed to 50% and reduces air infiltration by up to 40%. Whatever the condition of the exterior envelope, SureSeal keeps your interior living space comfortable, dry and energy efficient.